Go to Add sources > Screen Capture then Smart Selection. Select the area of your desktop or target window with the targeting reticle that appears. Clicking captures the whole target area while clicking and dragging captures a region. 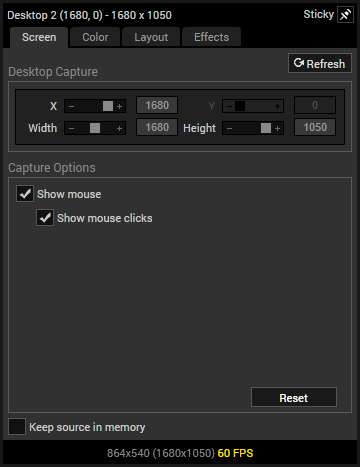 Go to Add sources > Screen Capture > Monitor Capture then select which desktop you want to capture. Adjust captured region using the X, Y, Width and Height sliders. Shows the mouse cursor when it's inside the captured region. Shows a visual cue whenever the mouse is clicked inside the captured region. Go to Add sources > Screen Capture > Window Capture then select which application you want to capture. 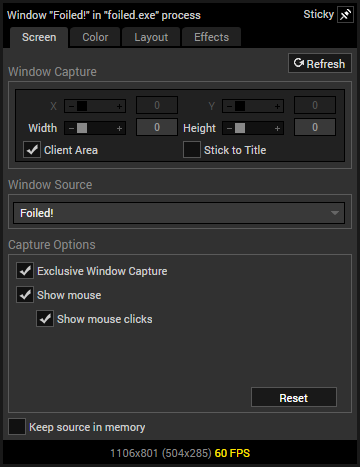 Only captures the client area of the window removing non-client area window elements such as title bars, menu bars, the minimize and maximize buttons, etc. Only captures windows with the same exact title. Disabling this will instead capture another window of the same process. Change the current captured window to another. Only captures the source window or window region even if other windows are on top. See below for more information. Exclusive Window Capture allows you to show a window or window region’s contents regardless if other windows are on top of it. Any windows on top of a source with Exclusive Window Capture turned ON will not be captured.